Parking for T3 - PAY ATTENTION to this!! Only allowed to park in the GREEN areas. As per Neil “ If anybodys tires are over the grass on my lawn they are screwed! Challenge 5 - Can you quack like a duck? Here is a little secret - - - you will be doing some duck walks during the T3 so we want you to get a little bit of practice…. Cadre Rooney was a huge part of the GORUCK community and an inspiration to so many people. Those who had the privilege of attending one of his events have nothing but the utmost respect for him. Reading some of the comments about who he was and how he helped others is nothing short of amazing. Sadly Josh lost his battle with cancer and this next challenge is one small way we as a team can honor him and his family. Cadre Rooney was a part of the 75th ranger battalion and during his events he always made the team do one exercise 75 times. To honor him and his service to our country, you will do 75 burpees. If 8 of you complete this challenge, we will also unlock your perks! Great job guys, you killed the wall sit challenge! Geography and trivia unlocked. Your Trivia will be the revolutionary war- enough said...know everything about it and the people/events surrounding it! Geography - EVERYbody generally fails this. If you are wise you will study prior to the event. As a team you will have to identify all 54 countries of Africa. For those of you that don’t know Neil is like a freak of nature when it comes to the geography, basically the Dustin Hoffman in rain man of this challenge. SO this time we want to give him a great challenge. So we were a little upset that only 2 people attempted a 5k PR when challenged to do so. One person was able to hit there PR. Great work Jeff Torres. Unfortunately we asked for only 2 out of the entire group and only 2 even attempted it. We are hoping you guys will band together and get this challenge done! This is not easy and it is not meant to be. You may have to do something similar to this at the event so we want to see if you can do it. When you really start to feel it or it hurts do not give up! Challenge- 2 minute wall sit. Lean up against a wall so your back is flat against the wall and your knees are at a 90 degree angle. 8 out of 10 people need to complete this to unlock the trivia and geography. Trust me you are going to want this info before the event. Work as a team and round up the troops to get this accomplished. So me running one of my faster 5k’s in a few years gave me an idea. Since you did not unlock your trivia category on the last challenge. If two of you go out and PR your 5k (show us some sort of proof, IE.. show another 5k time at least and be honest) I will unlock your trivia category. You have three days to do so. In this challenge you will need to work together as a team and communicate with each other. This is your scavenger hunt! Do not be late. For every minute that somebody is late, those who are there will have to complete 20 burpees. Don’t screw your teammates! Do everyone a favor and plan for the unexpected, and if you decide to drop before the event starts, you’d best let the instructor of the event know ahead of time. If you are 30 minutes late, you will be DNF’d from the event after having made all of the responsible people unnecessary burpees. Again…. Do not be late. There will be an optional bonus lap for those who wish to partake at 0640. Sometimes that means doing extra work for no reward, other times it means getting a reward for no extra work. It’s a gamble. • A laminated picture of Neil Murphy in kitty shorts (8x11) in color with everybody’s name signed on the back. That’s all for the gear requirements for now. We reserve the right to add to this list at any time, so be sure to keep your eyes peeled on to the T3 Live Updates page. Attention to detail will make or break your T3. In keeping with the spirit of the last T3, we are asking this time that you pick a charity of your choice and make any size donation to it and bring proof to the event. If you cannot financially do so or if you just prefer action over money, we would also accept proof of donating your time to something for your favorite charity. This team started as a couple of people training for a 5k OCR. I love how people can come and go from this team as their lives allow and you still have your training family whenever you need them. Always there for you. Hopefully you will learn something from this event and take it with you in your everyday life. We sincerely look forward to helping you all achieve your goals on the 27thof April. Packing List, who wants to get started on what they need to bring? You may have seen that Challenge #2 was posted last week. While we have had a few participants complete this, there are still quite a few folks that have not yet. Here is a little incentive to get that done. If 3 more people complete challenge #2 by the deadline, we will post your complete mandatory packing list and a little more information about event day by Friday of this week. if 4 more people complete the challenge by the deadline, we will release your trivia topic as well. Pregame challenge #2 - Bring Sally Up!! This one is going to punish the entire body if you accept the challenge! In case you don’t know what it is (Id be shocked if anyone here did not)…. 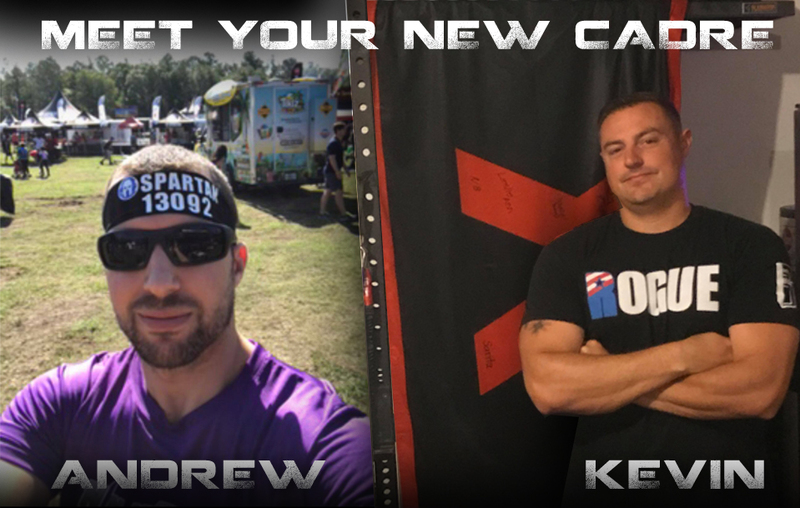 Announcing the two cadre for the upcoming T3! Andrew has done over FOUR T3 events in the past, and has many ultras under his belt to back up his endurance prowess. Kevin has two T3s under his belt and is an absolute mammoth of an athlete who can repeatedly take the pain and stand right back up with a smile on his face! These two instructors have bottled up the pain and suffering of all of their T3s in the past and fully intend on unleashing it all upon those who are brave enough to do the T3 Classic on the 27th of April! Since this is the classic, there are some known pieces of the event that can be easily shared. One of these pieces is the six mile run route and of course the checkpoint, labeled as the start point in the below picture. As you can see, it's very simple - just six loops of a one mile section of sidewalk. There will be an aid station along the way, should you need it. - Run six miles and upload proof of it at the event page on Facebook. - Cannot be done on a treadmill or at an OCR. - Completion earns you two points. And so it begins. With five people registering almost immediately, it seems that this adventure will be starting off hot! Keep your eyes peeled for some interesting pregame challenges, and be sure to register ASAP! This one is super cheap since we don't have to pay for hotels or renting out pools or any of that nonsense. We're going back to our roots at this one! Congratulations to the finishers of the T3! 15 registered, 11 showed up, 10 finished! More pictures to be posted on our Facebook page and on this page!